Hey Folks, Welcome on OnlyLoudest. Recently, I have written a post on a common topic “How to Add Categories and Subcategories to WordPress” and today again I selected a similar simple looking topic “How to Make Sticky Posts in WordPress” for all WordPress Newbies, who might face some difficulty creating sticky posts. But first of all, I will explain “What it is and why it is done”. You will find many instances in your blogging career, when you want some posts to always remain at the top of the Homepage. So, the posts remaining at the top of the homepage, no matter how many new articles published, that post are called sticky post. All the new articles will be shown below sticky post. You can use this method showcase your best content, or the old content which is still worth reading or you want your readers to read that content. For Example, You Blogging story or a case study would be a perfect sticky post for your blog. So, Now, I move and provide a simple guide, which will help you create sticky post. 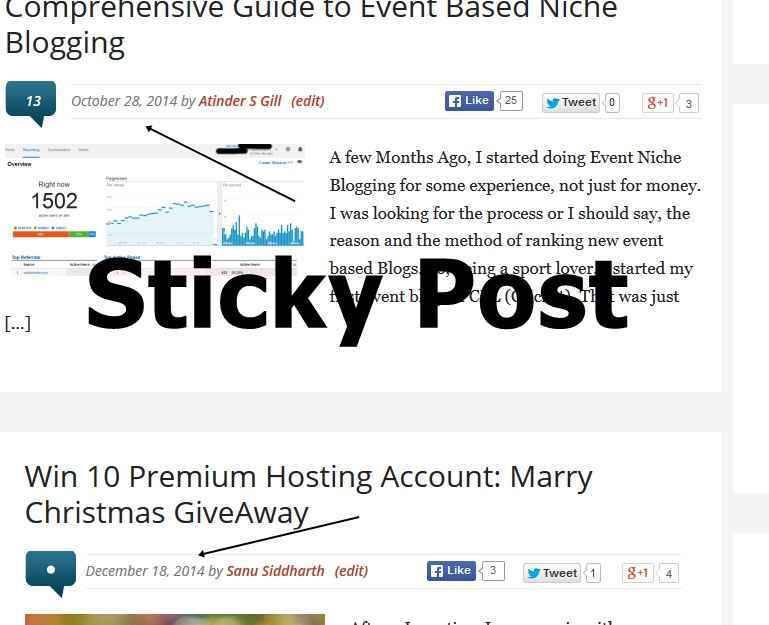 To create a sticky post, you need to Login to your WordPress dashboard and Open Posts Menu. In the posts section, find your Post, which you want to be sticky at the homepage. Once you find, click on Quick Edit and check the tick mark at “Make this post sticky ” as shown in the screenshot. 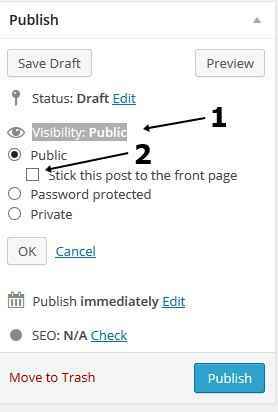 So, this is the simple guide for old articles, but if you are looking to make new published articles sticky posts, then, you just need to tick mark “Stick this post to the front page” in the “Visibility: Public” in right hand sidebar section as shown in the screenshot. So, that’s it. You are done. Don’t forget to share this article with your friends who just started with WordPress.